She absolutely enjoyed it. It was freezing chilly outside and I could not withstand the cold. But she was bouncing in the snow and was not ready to get back home. Yay, little Liya is a wonderful story teller. She creates little stories and shares with her toys. At times, she tries to put 'Momma to sleep' by sharing stories.. Ha ha, how cute! A sample story: There was a sheep. She was hungry. She told to her mom "Momma I am very hungry". Then Momma gave her food. And the story is over. If she just don't get what to say, she will stop story right there with a sentence "That's it. Story is over." She makes several stories. It's so much fun listening to her imaginations. Yes, little Liya learned to dress up all by herself. She doesn't know to wear a T shirt properly. She puts her both hands and yells out for help. But she knows to wear pants, skirts, jackets, shirts, socks etc. She also knows to dress up her dolls. Is that Liya in a sari, Nish? Kids learn to dress in a Sari when they are in India. Cute little girl!! Kiss and hugs from me and Aisha to Liya Didi. Is that liya in a sari, Nish? Kids learn to dress up in a sari when they reach India. I hope liya too loves to do it with Mamma's shawl. 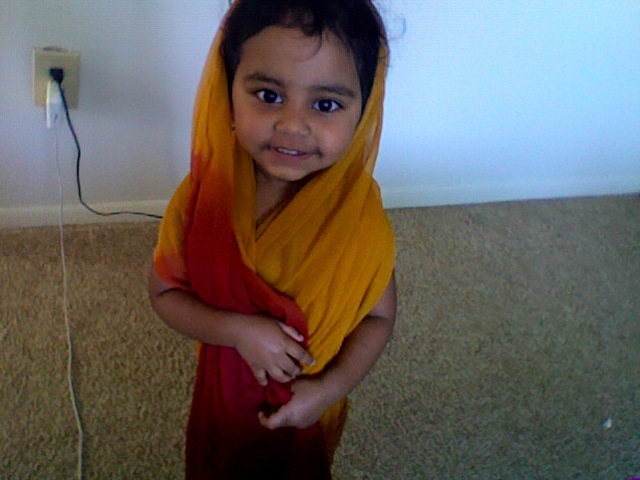 Kisses and hugs to Liya deedi from Aisha. I love it all Liya...First snow, playing dress up and Putting mom to sleep with stories. I can't wait to see what else you've been doing. So sorry I've been a lazy commenters these days.I've been away and that flu didn't want to leave me! mashALLAH so much to discover and learn.Congrats on Liyalearning how to dress up. I really love the way she enjoys snow under her feet in the video.Precious moments mashALLAH.Enjoy every bit of it as kids grow up so fast. Sarah - That sounds interesting perspective. I never analyzed it in that way. Thank you so much. I am extremely excited now. Salam - Ha ha...we are doing a lot of hell things...This blog won't be enough to scribble all those..You must be knowing better. Parenting 3 children might have gifted you with insanity..! Um Z - We know you have been busy with a lot of things around. No worries.. And yes, they grow up fast and will make us being empty, right?